I was 15 yrs old when I received my first kiss. Or at least that "first kiss" coming-of-age dramas glorify. Despite the fact that the situation involved two teenagers who were extremely awkward in their moves, there was an innocence that existed in the moment. My first kiss with Grey held that innocence too and to this day I can't walk by the bar where this incident happened without blushing a little. For the past month, He-Beat has been giving kisses. Usually in the evening, during preparations for bed, we'll have a moment where he'll get a sleepy look on his face, close his eyes and lean into my face with his tongue half sticking out. It's a bit of a sloppy experience, but one that is filled with so much innocence and sweetness that one can't help cherishing it. This behavior he's been displaying with both me and She-Beat (poor Grey desperately wants to be a part of this too), but She-Beat hasn't shown much interest in returning the favor. Something that none of us have pushed (well, maybe He-Beat), but I've still been watching for. Saturday evening, the Beats and I went a get-together at our friends' house. Grey had been feeling under the weather so was unable to join us, but made me promise to get pictures as the mention of a sprinkler promised toddler hijinks. Following introductions to new families and a light dinner, the sprinkler was turned on and a kiddie pool filled. Toddlers were stripped and adults circled the perimeter to walk. He-Beat could not contain his excitement. Despite the water being chilly, he was in the thick of the madness, helping his new friend fill pails that were immediately dumped and running through the sprinkler. She-Beat was a bit more timid, instead watching from a distance and testing the water continually making it clear it wasn't at a temp to her liking. As I sat watching them, She-Beat came over to me and demanded I spread my legs so she could place herself in between them. A safe haven she's claimed as her own. Leaning over absent-mindedly, I wrapped my arms around her as I watched her brother. Preparing myself to bolt if he got into anything that required intervention. It was during that hug that I instinctively kissed her cheek. Immediately she turned her head and pressed her lips against my cheek, making a distinct smacking sound. Smiling, she turned back to watching her brother, settling into her space while I gazed in disbelief at her, trying to process what had happened. A moment that was so quick and yet forever engrained in my being. Thursday morning, Grey and I made the track to the other side of the lake for She-Beats second round of surgery. Like her brother, her first set of ear tubes had fallen out and she was once again experiencing chronic ear infections. To resolve this, the doctor wanted to place a more secure set of ear tubes called T-tubes hoping they would last longer. The work up to the surgery went smoothly, with all of us now very use to the routine. After she was wheeled back for surgery, Grey and I went to the recover room to wait. Normally a very fast procedure with quick turn around. Except this time it took longer. Grey went to find coffee, assuming that he would return to find the doctor giving me discharge instructions and comforting a groggy She-Beat. Instead when he came into the room, he found the doctor sitting with me, attempting to explain what he had unexpectedly found. The look on my face made him drop the coffee and immediately grab for my hand. The doctor popped up and went to the whiteboard in the room, drawing and explaining the growth they had found. What they found in She-Beat's ear is a chlolesteatoma. It's not malignant, but it is a serious condition that left untreated causes hearing loss, vertigo and can lead to brain infections and facial paralysis. Because of the seriousness, the surgeon wants to move fast and schedule a more extensive surgery involving a CT scan and operation within the next month. He seemed hopeful based on it's size (it's small) and location (not too close to the bones in the middle ear) that hearing loss would be minimal. Still, we won't know until the day of surgery exactly what we're looking at. Following getting a very upset She-Beat home and down for a nap, Grey broke down. He sobbed in a manner I haven't seen in 3 years. 3 years ago following our miscarriages and failed third IVF. Wrapping my arms around him, I felt completely powerless. I've watched friends live through diagnoses for their children that involve extensive surgery. Trending carefully to be supportive but also being aware that one can't promise a positive outcome. In addition, I've seen others given diagnoses or face trauma that turns their lives upside-down and inside-out. In every case, there's that moment where the decision for how to approach the news is made. In some cases, the depression and numbness takes over, but in others a decision is made to fight for life, crawling one's way out of the darkness and demanding there be light. Even if they stumble or encounter new barriers along the way. In every case, the simple fact they are choosing life is inspiration and impressive. Following a long nap, I took She-Beat out on a walk. Exploring one of the alleys with her, I watched as she stopped to smell the flowers, poked at rocks and happily hummed the whole way. Half-way down the alley I saw a suspicious looking man twitching as he sucked on a cigarette. Initially he glared at me, making in clear he was not to be trusted. It was as I reached for She-Beat to turn around that she began to wave and cheerfully call "Hi" to this person. Startled, he jumped up and dashed away. It was in that moment that I realized that She-Beat was going to make all of this okay. Because this little girl has more fight and life in her than most people I know. From the day she was born, at 3 lb 7 oz, she's demanded to live. And every day since, despite the stumbles, the delays, the scary moments and even the barriers, she's found a way to overcome. And this new challenge will be no different. Despite my faith in She-Beat, I'm still scared. The more I read the more I know what is to come. And I wish with my whole being that it was me that would be on that operating table. But for now, all I can do is prepare, making sure I'm the support both she, her brother and even Grey need during this time. To become the rock they need me to be. There's a period with healing that is initiated almost immediately after the shock that comes from bad news. A calm that overcomes the body following the anger, the sadness and even the white hot flush. It's with that calm that our whole beings can become peaceful as the news seeps into our bones. The new reality sets in when the dream of the one we wanted dies. This morning that calm is setting in. With news of the heat wave in Seattle (90 degrees F is considered very hot here), it's hard not to simply surrender and reflect. So as I spend the day grading and reorganizing my thoughts, I'm allowing the healing to begin. Finding the calm after the storm. Friday afternoon, I got the text I've been waiting for from Grey. It had been a long week, fueled by a car accident (more on that later) and a student who went MIA during a final presentation (the explanation given after much pushing was he was dealing with "excessive gas," so decided to spend some time in the bathroom without telling anyone). So I was already on edge and hoping for some good news. Unfortunately, despite them being impressed with his skill set and background, they decided to go with a different candidate. For his part, Grey has been taking all of this in stride. In addition to one contact heating up, he had a phone interview with a recruiter from another company that is extremely interested in him and reaching out to a contact at another company has resulted in them wanting to chat very soon. Grey is doing everything right and I'm so proud of him for continuing to push on this. But I feel so defeated. Shortly after this news, I had a horrible experience with a failed nap-time for the classroom with the 3 yr olds at the daycare. Two little girls who insisted on jumping up and down on their cots, screaming at the tops of their lungs. As I felt my anger rising from knowing that the only reason they were misbehaving was because I was in the room (I'm new to them), I also got a glimpse of what my future held and immediately felt defeated. So many negative thoughts came following that experience as I took a very long walk. So much sadness and frustration. 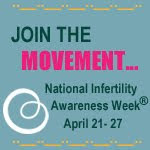 Like many who have lived with infertility, I know all too well after the emotions that come following failure. First the failure to even achieve pregnancy the "natural" way, then to countless failed treatments to finally facing an uncertain future when your options for the road you're on have run out. The guilt and shame that immediately comes, followed by anger and sadness. But most of all the doubt. That maybe all of this is a sign that things are not meant to be. That maybe you don't deserve what so many seem to be able to achieve simply by forgetting the birth control. Our society is one that focuses on success. Those that achieve what they set out for, even if for them they have every possible advantage. Rarely do we talk about failure and celebrate finding other roads. Instead the mantra is "keep trying" "don't give up" and "if you work hard enough, good things will come." But what if it's not a matter of work? What if the deck is stacked against us, with us barely getting a glimpse of the iceberg that we are facing? What if it's truly a matter of luck or biology? Things that we can't possibly begin to control? Add in the wrinkle of when we're not the ones on the receiving new of the bad news. After all, I'm now very seasoned with confronting failure. But not when the news is for Grey. Not those that I love. Today I heard news from a long-time friend that her second FET failed. Standing in the kitchen, the tears easily began to flow as I remembered the pain that came with this news. Rapidly wiping them away, I quickly tapped out an "I'm so sorry" before I had to get back to the task at hand, promising to call tonight to talk. The thing is, I feel so powerless because even though I can call and offer words of comfort, none of that will give her what her heart longs for. Something she should have to be fighting for. And it angers me because I know in my heart she's an awesome mom and would raise a child in a home filled with love. All of that on the heels of direct interactions from examples where the parents instead use their children as pawns in their sick and twisted games they call life. Parents who are children themselves. I'm struggling with the "no"s. The "no" to work that could mark transition, the "no" to futures that should be happening without question. The "no" to roads that our society shuns and is afraid of. The "no"s that lead to stigma and shame instead of change. If you are successful, you will win some false friend and some true enemies; succeed anyway. Give the world the best you have and it may never be enough; give the world the best you've got anyway. In this spirit, I have my own to add. On this journey, we all will fail. We all will encounter something that knocks the wind out of us and makes us wonder why we try. We will be told we were silly to dream or that we simply didn't want it enough if we decide to close the door and pursue a different path. Pick yourself up and hold your head high as you continue down this road called life anyway. Because in the end, there will always be "no"s. But it's not the "no"s that define us. "It's okay to be a glow-stick. Sometimes we need to break before we shine." This weekend was a rollercoaster of emotions. On top of hearing no news about Grey's interview, we said goodbye to close friends who are moving to the East Coast and I made the decision to accept a teaching position here in the fall. Both Grey and I have done lots of reading to know that the silence isn't necessarily a bad thing, as he would have likely gotten a "no" if they weren't interested in him. But after years of having it be the opposite and on top of the other two events, we've both been down. Sunday afternoon marked a transition. Grey spent most of the weekend resuming his job hunt and making connections with those who have contacts. He now knows how to play this game of networking, which I'm learning more about peripherally. But something has also broken. Maybe it's the fact that we are the last ones' standing from our originally group of friends or that the condo building drama is heating up again, but we're both more determined than ever to push for this transition. Finding the above quote while out for a walk was an added sign for this. This weekend we cracked. Now it's time to shine.